Let me reiterate this: I do not enjoy running. Not one little bit. But I really like the "I just finished a 5K!" feeling so that kind of negates the whole running thing. Kind of. It also helps when you're running in a 5K with a group of people that you know. My first ever 5K participation was due to a coworker who decided to round up a group of runners at work & then get the company to sponsor us in a 5K. It's kind of hard to not sign up for a 5K when it's paid for & it's with your friends. In June, I got another group from work together to run a 2nd 5K. 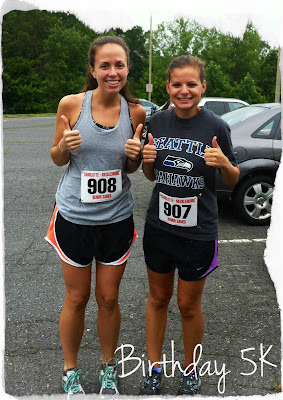 Have you ever run a 5K on a Friday night in the summer? It's hot & muggy & this summer, rainy. At least I'll have good music to listen to? I have song ADD and tend to listen to the first 30 seconds of a song and get bored and have to switch to another, so my playlists are always longer than my races. I'm dreading the day I hit the end of a playlist before I'm done. You'll have to check back next week to see how the race goes but here's to finishing in under 30 min! haha love it! So sad I'm missing it! p.s. Avicii was last week's song addiction for me. Love it. You should try out Royals by LORDE. So good. Good luck this weekend! Don't let Kevin beat you! I'll have to check that song out! you better be around for the next 5k! Photo Lovin' Friday: Happy Birthday!